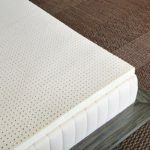 Here we’ll be discussing about the mattress toppers and the best options that are available for you on the market in UK. We’ll be discussing about how you can find a great quality, best rated mattress topper and what should be your first choice on the basis of your needs and requirements. In case, you need a detailed information regarding the usage and choosing from the best options, you can surely search for these topics on this site to find satisfactory answers, in detail. To help you save time and effort when looking for a new mattress topper, we have selected the best products that are available on the UK market. Our suggestions have been decided after days of research and comparative study. We hope that you will find the best one which fit your needs from our list. This product is one of the best seller toppers that has been introduced by Southern Foam. This mattress topper has proven its worth and has got plenty of great response from the buyers. The foam is manufactured by using high quality memory foam that is prepared in UK. It assures that you would not be getting a low quality memory foam. The topper has been designed to give the best sleeping experience that you deserve, through a great supportive consistency and an excellent, luxurious feel. 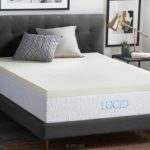 It works best when you put it on your conventional mattress, to which you need to add a supportive and comfortable layer that would provide a consistent support for your body. The topper comes in a standard double size and have the dimensions: 75”x54”x3″ (190x137x7.5cm). It is 3 inches thick. 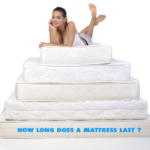 This thickness level is best when you need soft yet supportive and firm layer on the mattress. Its firmness does not provide a hard layer, rather gives a well balanced, soft feel, throughout the surface. The density of this mattress topper is about 40-45kg/m3 as stated by the manufacturer. This density level makes sure that you get a complete comfortable layer as well as a soft yet sturdy and consistent support to your body without any feeling of discomfort. This one can be adjusted to match the exact dimensions of your double mattress if you have a smaller version of double mattress. Memory foam smell is there that you will have to manage for a few days and it will fade out after that. With its high quality and very affordable prices, this memory foam mattress topper is a great choice for anyone. This topper is our top pick for the best mattress topper in UK, we highly recommend you to take a look at it. The Bodymould 2” Memory Foam Topper is an excellent way to add comfort and luxury to your existing mattress and improve your sleeping patterns to a large extent. It works wonderfully to provide relief and comfort to all the significant pressure points of the body which improves blood circulation throughout the body, reduces muscle soreness and relieves joint aches. 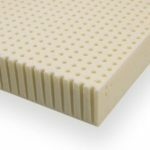 This memory foam is 2” thick and manufactures in UK, it is fully compliant with the furniture fire regulations of UK and can be ordered to customize according to your size requirements. The topper also has a 100% polyester cover so people with skin allergies can sleep on it quite peacefully and enjoy the ease of a relaxed and calm sleep. 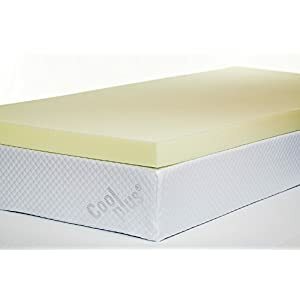 This memory foam mattress topper is thick, but not too firm and provides a soft layer to your underlying firm mattress or if your mattress is worn out, this topper will save you from spending extra money by providing sufficient support to your underlying mattress. The topper is easy to clean and its polyester cover has a zip casing so you can take it off and wash easily in a washing machine. 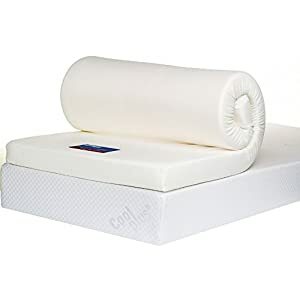 Manufactures with 40kg memory foam, this mattress topper gradually absorbs all the pressure of your body and molds accordingly without sinking too much, while making sure that it re-gain its shape when the pressure is relieved. Moreover, the customer service by Bodymould is quick and efficient and ensures to provide for all kinds of problems you might be facing with the product. It weighs around 4-9 kg (with cover), comes in a secure packing and there is only a faint smell which goes away after airing it out for a few hours. It is recommended to keep changing the sides of the mattress and put it in the open air on a regular basis to prevent damage to its shape and texture. This mattress topper is really worth a try. This is a product by Visco 5000. Being a quality product manufacturer, this one also is an excellent example of the quality that is promised to be offered in the products. It is a luxury mattress topper that is 3 inches thick and is a double sized topper which would be 190 x 7.5 x 135 cm. The size easily fits to the standard double beds. The topper can serve at best when used to increase the comfort level and improve the thickness of a saggy worn out bedding system. It is great to be used when you need to add a soft and luxurious feel and also a plenty of body support to sleep in a balanced way. The mattress topper is made of high quality memory foam technology that is able to give you excellent comfort with the density of 50kg/cm3. The density and the 3 inch thickness work ideally with your mattress and gives the best comfort level that you could achieve, while sleeping on your bed. It improves the overall comfort level and also the sleep posture of your body. 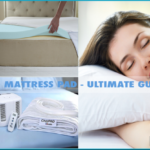 Not only useful for people who need extra soft layer, but also for those who suffer from fatigue and bodily pain while asleep. These symptoms can be a cause of pressure point development and can easily be avoided by using a memory foam topper like this one. This topper used high quality memory foam material that conforms to your body and cradles the whole posture in a way that you don’t feel pressure at all. It has the capability to justify the body temperatures and it would not let you feel sweaty. Due to an excellent support it would help you retain your spinal cord in its best posture and form. It comes with a soft removable cover that can be washed separately. There could be a size difference due to the packaging compression process, and also some sort of smell due to the act memory foam has a smell, that would take some days to vanish out completely. So, dint get alarmed due to that. It is a lot better than other same category toppers, trusted by the users and comes at a reasonable price. This Bodymould mattress topper is 4” thick and provides a great combination of comfy, yet firm bedding attire which helps you sleep comfortably all night long and wake up with a fresh and healed body. It provides ultimate support to your underlying mattress and tones up your sore and tired muscles while reliving all kinds of back and joint aches. 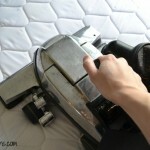 It is solely manufactured in UK and is thick enough to revive up your old bed mattress hence saves you a lot of money. The topper can be folded easily which makes it easier to carry it around the house or take it along your travels. The coolmax mattress cover is washable and adds a soft, plushy and attractive layer to the mattress topper. This topper is designed with strategic pressure points which relaxes your body in a wonderful manner and improves blood circulation as well. Bodymould 4-Inch comes in 5 different sizes to provide you more options and fits your mattress well without tossing around while you sleep on it. The coolmax cover keeps it cool and gives a sense of luxury to your bedroom making the maintenance and cleaning routine all simpler and easier. There is only a slight faint smell that comes with the packing and fades away quickly after opening. 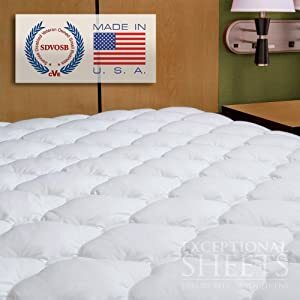 The 4” thickness of the topper gives it a firm yet soft texture which makes the topper and mattress mold quickly to your body shape and allows it to regain its shape as soon as the pressure is released. It is also well known for treating back aches and joint pains which makes your daily living more comfortable and easier. Besides, the topper comes at a very economical price and the customer service is super quick and responsive. If you are looking for a good topper, this one is a great choice. A mattress topper plays many functions when it has been put on the top of the mattress. It can provide a luxurious padding for extra comfort, can protect the mattress from being pressed too much and also can serve to protect the mattress from any bed wetting issues and will keep the mattress safe from getting wet. But truth is that not all mattress toppers are able to serve for all of these functions. You may find one or two or three features, but not all except for this mattress topper. This Extra Plush topper has got the water proofing capability, luxurious feel and excellent fitting on your mattress. It has got a specialized water proof layer or barrier that will act as a protector for the mattress and would not let the moisture or water or any liquid reach the mattress in any way. The topper has been manufactured by using excellent quality down fiber, which is completely hypoallergenic and has an advanced cooling technology, that makes it comfortable as well as sweat free. This topper got all the capabilities to protect the mattress from any moisture attack, gives a cooling effect and can be put onto a mattress that feels too hot when lying on it. Also, it adds superior luxurious feel to the user. The topper is very easy to maintain as it has got a 123 TC cotton cover on which has been declared as stain resistant and can be washed in machines. The topper has a full back by the manufacturer and offers a full money back guarantee if you are not satisfied with its features. 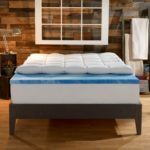 Concluding our discussion regarding the 5 of the best options on the UK market of best mattress topper, we should say we have got all the top rated mattress topper reviewed here. 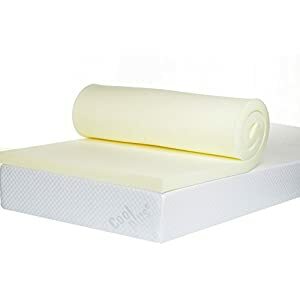 Whether you need to buy a memory foam topper for your mattress to increase its softness or for your bodily issues, or need to add extra plush by using down fiber mattress topper, you can select from the above given products. We have reviewed them carefully, ensuring that you know all the features that are being offered there for you. So, there would be any ambiguity regarding choosing any of these five. Make up your mind and select the one that suits you the best.